Motoyama (original mountain) district is located close to my University, right in the next stop of Nagoya's Meijo subway line (in counter clockwise direction). 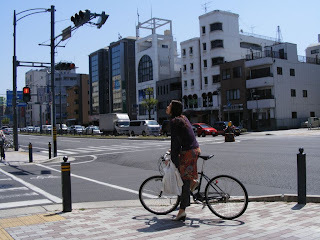 At the centre of Motoyama, there is a big crossing between two main avenues where one can find different shops, restaurants and also a pachinko-karaoke called Shinsekai that I went to with some friends the other day. 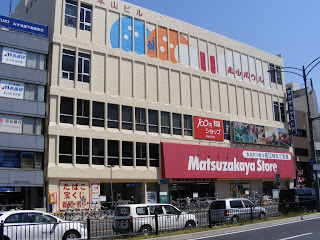 Perhaps the most interesting building is the Matsuzakaya commercial centre which has several floors of shops. In the basement there is a big supermarket with fresh food (vegetables, fish, meat, etc). On the first floor you can find sort of delicatessen products of high quality (and price!). 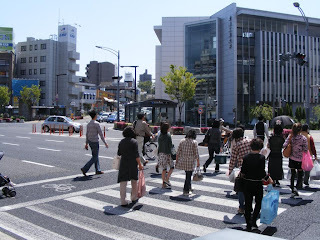 On the upper floor there is a 100-yen shop (each article costs 100 yen), clothes shops and the like. Although it is a wide avenue, there is not as much traffic as you would think. 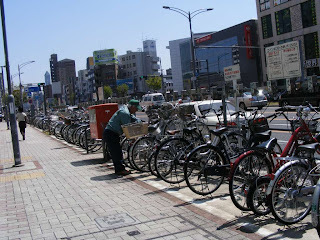 Probably one of the major reasons is that the bike is really a popular means of transport here in Nagoya. Having a bike here is close to having a car in the sense that you need a plate and you can't park it anywhere but in the designated areas. I have seen many times workers in charge of ordering the bikes so there is more parking for everybody :). 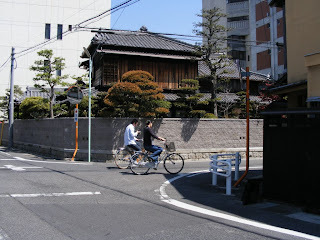 If you walk away from the main avenue you will see the typical small houses and narrow streets that are all over Japan. This streets are really quiet and calm, they remind me a lot of the animation series that I used to watch when I was a child. In particular I love all those wires and cables above our heads. 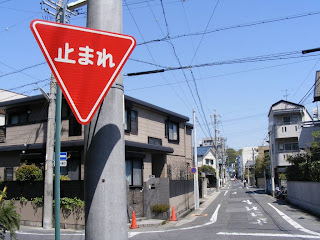 The sign in the picture (and the ground in the opposite direction) contains a very useful word: tomare (とまれ - 止まれ) which means STOP :).